Men, if you're planning on having children, it might not be such a good idea to have that laptop sitting on your legs, even if you use a laptop pad. Researchers at Stony Brook University in New York have found that sitting with a laptop computer on your legs can elevate temperatures in the scrotum, a condition known as scrotal hyperthermia. Although the study doesn't explicitly state that this could cause infertility, other studies have linked increased scrotal temperatures to the inability to naturally produce children, according to Reuters. The Stony Brook researchers' findings are published in the November volume of the monthly medical journal Fertility and Sterility. Yefim Sheynkin, the study's lead researcher, told Reuters that volunteers in the study volunteers started experiencing unsafe temperatures after sitting with a laptop for 10 to 15 minutes. The study used thermometers to measure the scrotal temperatures of 29 male volunteers who sat with a laptop on their legs for three separate 60-minute sessions. The first 60 minutes, the men sat with a laptop directly on their lap, the second round, the men used a laptop pad, and for the final session the men used a laptop pad with their legs spread apart at about a 70-degree angle. In every position, the scrotal temperature increased, although the heat took about 30 minutes to get going when using the laptop pad. It's not clear what kind of laptop pads the men used, or whether different types of cooling pads and laptop desks offer better heat protection than others. The researchers concluded that if you want to keep things cool below the waist, you're better off leaving the laptop on the table instead of your lap. If you must balance your laptop on your legs, researchers advise keeping your legs spread apart and only sitting in that position for significantly shorter periods. This is not the first time researchers at Stony Brook have looked at laptops and the device's effects on male reproductive health. In 2004, Stony Brook researchers published a study in the UK journal Human Reproduction. 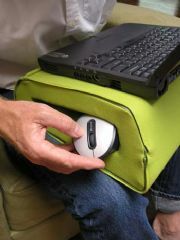 That study, again lead by Sheynkin, also linked sitting with laptops to scrotal hyperthermia; however, at the time Sheynkin posited that, "external protective devices [such as laptop pads] could help."